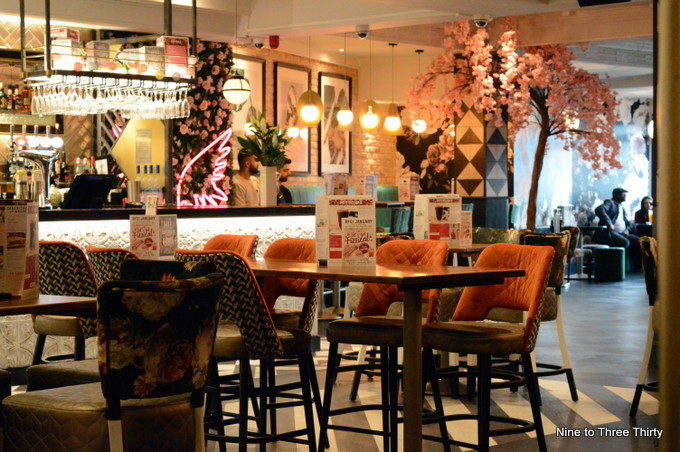 I was invited to try out a Tipsy Afternoon Tea at the Slug and Lettuce, Wolverhampton. It opened a little while before Christmas, but this was my first chance to see it. I was really impressed by the look of the whole place. There’s a certainly a bit of glitz and glamour going on and it adds something different to the pub and bar scene within Wolverhampton. When we arrived we were shown to our decorated afternoon tea booth and made to feel very welcome. The Afternoon Tea Packages offered by the Slug and Lettuce ranged from a classic tea with a traditional cuppa, through the tipsy tea with 2 glasses of prosecco to the cocktails & cakes with 2 cocktails. The food selection is the same in all cases, it’s just the drinks that differ. At £10 for the non-alcoholic and £15 for the alcoholic versions, I think these afternoon tea packages offer a great way to treat yourself without spending too much. 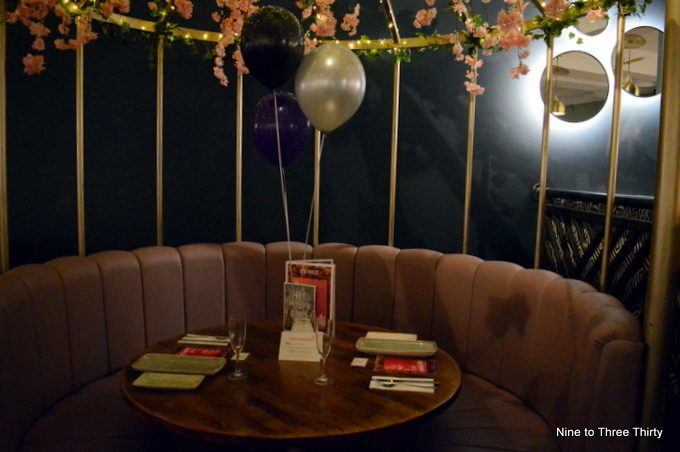 I thought the decorated, reserved booth was a lovely touch too. We decided that cocktails were just the thing and found ourselves spoilt for choice with quite an extensive selection available. 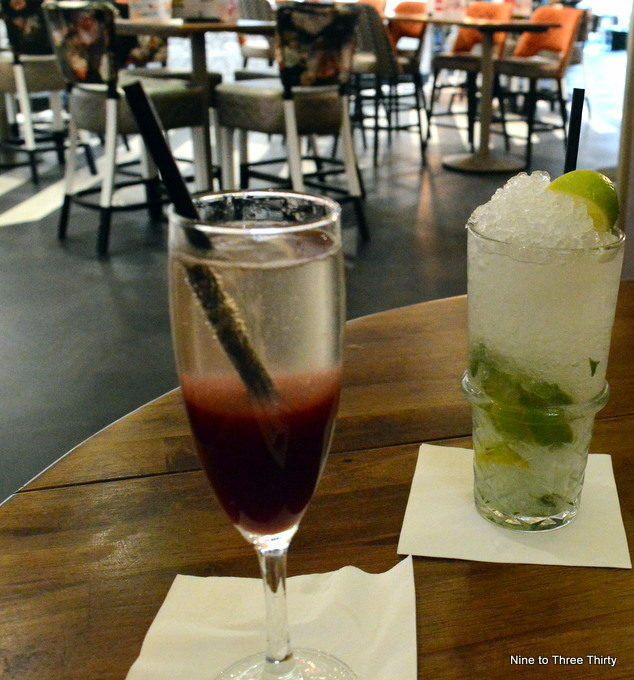 I opted for a classic Mojito whilst my friend went for the Raunchy Rhubarb. The mojito was long and cool and refreshing, just like it should be. The Raunchy Rhubarb wasn’t as tart as I thought it might be and it seemed to get the right blend of sweetness with a rhubarb kick. This is our food selection for the afternoon tea. There was a sandwich each of tuna mayo & cucumber; halloumi & avocado; and chicken & slow roasted tomato (there’s also a vegetarian option available). I really enjoyed the saltiness of the halloumi paired with the avocado. The sandwiches are generous enough for you for this to provide a meal for you, as they aren’t the typical crusts cut off type of sandwiches that you often see on afternoon tea platters. 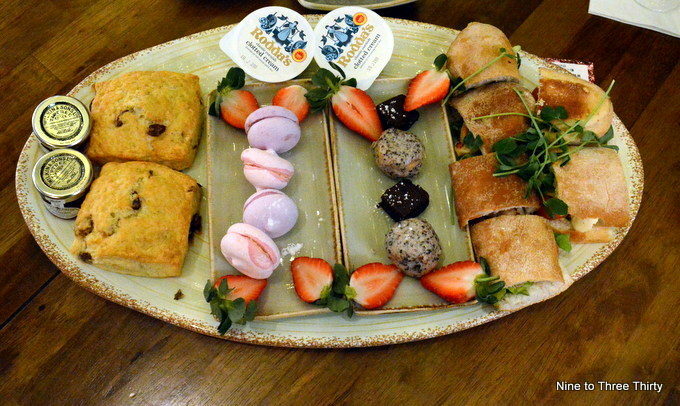 The scones were generous and tasty. Do you put your jam on first or the clotted cream? I was interested to see what the cookie crumb profiteroles were like (very gooey) and the chocolate brownies provided a little welcome crunch to provide a contrast. We finished off with the macaringues which were perfect sweet touch to end. I love how the seating area was decorated for you. That is really good value and I like the fact that the sandwiches have chunkier bread than usual.